COPIA was established in Napa seven years ago by vintner Robert Mondavi, his wife, Margrit, and chef and author Julia Child to embody a vision of "a small institution to educate, promote and celebrate American excellence and achievements in the culinary, winemaking and visual arts arenas." The trio couldn't have imagined a better interpreter of l'art culinaire than Jeff Mosher. 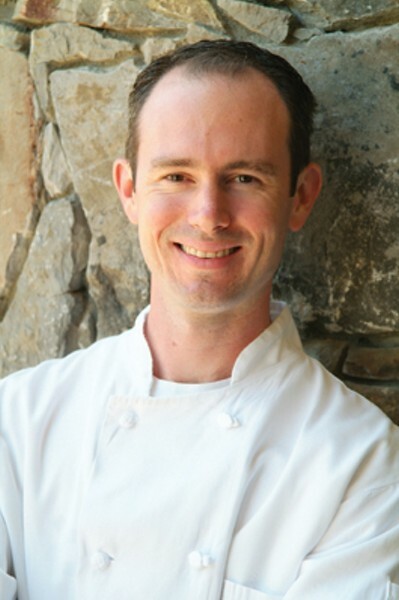 Mosher is executive chef at COPIA's notable, nonpareil Julia's Kitchen. If he at first appears to be an unassuming young man, don't assume that he is. Better than wearing his considerable pride on the sleeve of his immaculate, white chef coat, he plates it. Julia's offerings, since Mosher donned its exec toque four years ago, have come to stand alongside the best, most innovative and certainly the freshest in the North Bay's inestimable wine country. If you'd like to know what's on Mosher's mind more than simply how good he is at what he does, skip the next several paragraphs and turn the page to the interview of this rising (more like fully risen) culinary star, conducted on premises on a perfect, sunny, late October afternoon. Mosher's affair with French cooking began with a junior year semester abroad from Oberlin College to Strasbourg, France. After graduation, he moved to San Francisco and began his cooking career as a line chef at E&O Trading Company. Soon he was a sous chef at Clouds, then lead line cook at North Star. Moving up quickly, his last position, before becoming sous chef at Julia's Kitchen in 2004 and its executive chef two years later, was at Campton Place, cooking four-star contemporary cuisine under noted chefs Laurent Manrique and Daniel Humm. Mosher is, at once, quietly charming and fully forthcoming. But words can't reveal the chef compleat. So after our hour's chat, I accepted his invitation to prepare my lunch. I dined at Julia's Kitchen long before Mosher's reign. That meal was excellent. This one, assuredly, surpassed. The menu is "a tribute to Julia Child's original recipes interpreted by . . . Jeff Mosher." Julia would be pleased with Mosher's take on her classic recipes. I purposely selected a light entrée, a "garden-herb crusted big eye tuna salad," because I wanted to know what truly fresh vegetables tasted like. COPIA takes the locavore principle to a ridiculous extreme. The vegetables I'd be served were perhaps still growing this morning not 10 yards beyond my window table, plucked while sun-warmed from COPIA's copious three-and-a-half acre garden. My first dish was a smooth, sage-frothed butternut squash soup followed by the salad of fork-tender, lightly seared tuna, greens, cold potato coins, haricot verts, hard-boiled organic egg lightly dressed with a Dijon-caper vinaigrette. Worthy of note, too, was the doughy, house-made sourdough bread and, most memorable of all, a tiny amuse teacup of intensely savory tomato soup upon which floated a raft of crisped baby basil. Gone in a gulp, but not soon to be forgotten. Julia Child put her legacy into a simple statement that Jeff Mosher likes to quote: "French cooking isn't fancy cooking, it's just good cooking." The French-inspired Julia's Kitchen dishes reflect just that: good, perhaps great, cooking. Mosher indicates he may still be at the Kitchen five years from now, but I suggest you take a meal there soon. Talent like his tends to move on. Bohemian: What would Julia Child think of COPIA and her eponymously named restaurant today? Jeff Mosher: I think she'd love it because of how we've held to her food philosophy, even, often, her recipes. Remember, she was the first to introduce basic country French cooking to America, to emphasize the use of fresh, seasonal ingredients—and not mess with them—the first to search out the best local ingredients and use the whole animal: the chicken breast for fricassee, the legs for coq au vin, the rest for stock. What she expounded 50 years ago, I follow today. Name your favorite Bay Area restaurants. I had a fabulous meal at Cyrus in Healdsburg. Doug Keane is doing some amazing stuff there. In San Francisco, I like Del Fina and A16 for small, reasonably priced Italian. And in Napa, Ubuntu for vegetable-centric dishes. At whatever price, they're all ingredient-based restaurants. They start with the best kinds of stuff. Well, I have kids, so I like to stay in Napa where we live. I like Pizza Azzurro, Las Palmas for Mexican, especially the burritos and Taylor's for burgers. Name it, if you care to, but what's the worst meal you've ever had, or worst restaurant you've ever visited? I won't name the restaurant, but it was the service that ruined the evening. It took 15 minutes to be waited upon, the food came in the wrong order and it went downhill from there. Bad service can ruin a good meal. I'm a member of Slow Food Nation. We use the best seasonal ingredients obtained from local sources, I like to introduce new ideas based on classic recipes, and I keep my flavors distinct and clean, and my plates simple. Who influenced your cooking the most? Jacques Pepin. Especially one of his cookbooks on preparation that both clearly explained and showed his techniques. If you were somehow allowed only a single cookbook to use, would that be it? Yes, but I'd also want Julia's classic Mastering the Art of French Cooking. And maybe [Auguste] Escoffier. I guess that makes three. Is that OK? Sure. I noticed your menu offers a foie gras appetizer. You spent a semester in Strasbourg, the birthplace of foie gras. How do you justify foie gras in light of the recent controversy over its preparation? Not all foie gras is prepared the same. Animals are raised to be food, but we make sure that our sources are reputable and that they treat animals humanely. Our fowl are from Sonoma, and we know they're raised in a humane fashion. Our pork is "heritage" pork. We know the farmers who raise it. Brining seems to be growing in favor today. Do you brine your meats? We brine our pork chops for six to eight hours in a solution of salt, sugar and various spices. Mostly for flavor, and it helps make them a little more tender. I think I'll still be here in the Napa Valley. If I'm not at Julia's Kitchen, I'll probably be running some other fine restaurant. I may find a wealthy backer or something, but I don't know if I want to be an owner. I don't think I'd want to open a restaurant now in this economic climate. The true knowledge—and, perhaps, mettle—of a chef can be told through his recipes. With the holidays in the offing, here's a Mosher recipe you may want to try. Trim crust off bread and slice into 1-inch cubes. Toss with 1/4 cup duck fat, season with salt and pepper and toast in 350 degree oven for seven minutes. Sauté on medium: onions, celery and bacon lardoons in 1 tbsp. of duck fat. Once bacon begins to color, add garlic and sauté an additional two minutes. In separate pan, using 1 tbsp. duck fat, sauté mushrooms on high for 3&–4 minutes, season with salt and pepper. Cut chestnuts in half, add 1/4 cup duck fat, season with salt and pepper and roast at 400 degrees for 8&–10 minutes until a nice, golden brown then combine all ingredients in large mixing bowl. Add marjoram, as much of remaining duck fat as you wish, and the chicken stock. Stir all ingredients together and check seasoning. If stuffing a bird, omit chicken stock. If making separately, place stuffing in ovenproof pan, cover with foil and bake at 350 degrees for 15 minutes before serving. Serves six. Bon appetit!